The aim of this project is research on novel methods for the classical medical image analysis topics, i.e. segmentation, registration, computer-aided diagnosis, mostly with the help of machine learning methods, which have recently been very dominant in computer vision and image analysis. Martin Urschler, see also personal ICG website. 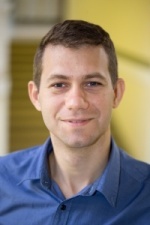 Darko Stern was a post doc at the Institute for Computer Graphics and Vision at Graz University of Technology, funded by the EU Marie Curie project YOUTH. 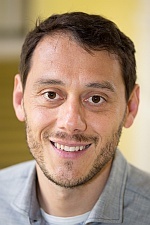 Currently he is a post doc at the Ludwig Boltzmann Institute for Computer Graphics and Vision, where he is funded from the FWF project FAME. Philipp Kainz was a research assistant at the Institute for Computer Graphics and Vision at Graz University of Technology, funded by the FWF project FAME. Christian Payer is a PhD student at the Institute for Computer Graphics and Vision at Graz University of Technology, funded by the FWF project FAME. He is interested in applications of deep learning in medical image analysis and currently focuses on automatic landmark localization algorithms. Franz Thaler is currently doing his master's thesis on volumetric reconstruction of CT images using machine learning approaches. Nikolaus Jaufer is currently doing his master's thesis on segmentation of muscle tissue of sheep vocal cords. Daria Zotova did a student project during an internship on multi-label segmentation of 3D heart volumes from MRI data. 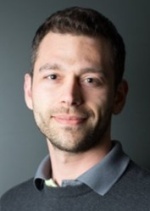 Thomas Neff has finished his master's thesis on the use of deep learning for unsupervised generation of synthetic data in segmentation problems. Kerstin Hammernik did her master's thesis on segmentation using convex regularization priors. 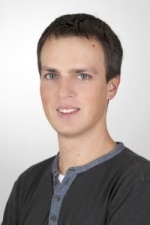 Fabian Schenk did his master's thesis on segmentation of human glottis videos. Marc Steiner did his master's thesis on statistical shape models using nonlinear manifolds. Christoph Gratl did his master's thesis on the application of 3D morphable models. In many medical image analysis applications, only a limited amount of training data is available due to the costs of image acquisition and the large manual annotation effort required from experts. Training recent state-of-the-art machine learning methods like convolutional neural networks (CNNs) from small datasets is a challenging task. In this work on anatomical landmark localization, we propose a CNN architecture that learns to split the localization task into two simpler sub-problems, reducing the overall need for large training datasets. Our fully convolutional SpatialConfiguration-Net (SCN) learns this simplification due to multiplying the heatmap predictions of its two components and by training the network in an end-to-end manner. Different to semantic segmentation, instance segmentation assigns unique labels to each individual instance of the same class. In this work, we propose a novel recurrent fully convolutional network architecture for tracking such instance segmentations over time. The network architecture incorporates convolutional gated recurrent units (ConvGRU) into a stacked hourglass network to utilize temporal video information. Furthermore, we train the network with a novel embedding loss based on cosine similarities, such that the network predicts unique embeddings for every instance throughout videos. We propose a 2D computed tomography (CT) slice image reconstruction method from a limited number of projection images using Wasserstein generative adversarial networks (wGAN). Our wGAN optimizes the 2D CT image reconstruction by utilizing an adversarial loss to improve the perceived image quality as well as an L1 content loss to enforce structural similarity to the target image. We evaluate our wGANs using different weight factors between the two loss functions and compare to a convolutional neural network (CNN) optimized on L1 and the Filtered Backprojection (FBP) method. In recent years, deep learning based methods achieved state-of-the-art performance in many computer vision tasks. However, these methods are typically supervised, and require large amounts of annotated data to train. Acquisition of annotated data can be a costly endeavor, especially for methods requiring pixel-wise annotations such as image segmentation. In this work we evaluate if GAN-based data augmentation using state-of-the-art methods, such as the Wasserstein GAN with gradient penalty, is a viable strategy for data augmentation in the context of small datasets. 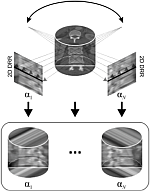 We propose a method for 3D computed tomography (CT) image reconstruction from 3D digitally reconstructed radiographs (DRR). The 3D DRR images are generated from 2D projection images of the 3D CT image from different angles and used to train a convolutional neural network (CNN). Experimental results show that our CNN based method is able to decrease the number of projection images necessary to reconstruct the original image without a significant reduction in image quality. 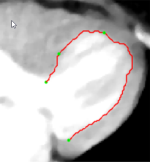 first, a convolutional neural network (CNN) localizes the center of the bounding box around all heart structures, such that the subsequent segmentation CNN can focus on this region. Trained in an end-to-end manner, the segmentation CNN transforms intermediate label predictions to positions of other labels. Thus, the network learns from the relative positions among labels and focuses on anatomically feasible configurations. We propose a two component fully-convolutional network for heatmap regression to perform multi-person pose estimation from images. The first component of the network predicts all body joints of all persons visible on an image, while the second component groups these body joints based on the position of the head of the person of interest. By applying the second component for all detected heads, the poses of all persons visible on an image are estimated. A subsequent geometric frame-by-frame tracker using distances of body joints tracks the poses of all detected persons throughout video sequences. Modern deep learning methods achieve state-of-the-art results in many computer vision tasks. While these methods perform well when trained on large datasets, deep learning methods suffer from overfitting and lack of generalization given smaller datasets. In medical image analysis, acquisition of images and ground-truth annotations is time consuming and costly. In this work we propose a new variant of GANs, which, in addition to synthesized medical images, also generates segmentation masks for the use in supervised medical image analysis applications. Segmentation of histopathology sections is an ubiquitous requirement in digital pathology and due to the large variability of biological tissue, machine learning techniques have shown superior performance over standard image processing methods. We describe a straightforward method to segment cells in SEM images. With the new software the segmentation is much faster than manual drawing. The segmentation output can be transferred to a variety of visualization tools. We introduce a fully automatic localization and segmentation pipeline for three-dimensional intervertebral discs (IVDs), consisting of a regression-based prediction of vertebral bodies and IVD positions as well as a 3D geodesic active contour segmentation delineating the IVDs. Automated cell detection in histopathology images is a hard problem due to the large variance of cell shape and appearance. We show that cells can be detected reliably in images by predicting, for each pixel location, a monotonous function of the distance to the center of the closest cell. Cell centers can then be identified by extracting local extremums of the predicted values. Automatic segmentation of 3D vertebrae is a challenging task in medical imaging. In this paper, we introduce a total variation (TV) based framework that incorporates an a priori model, i.e., a vertebral mean shape, image intensity and edge information. We present an interactive image and volume denoising and segmentation tool, that allows the use of state of the art algorithms based on the concept of total variation (TV) to be applied to 2D and 3D grey and color value data. Our aim is to provide a research tool for experimenting with TV related methods to the medical image analysis community. Verbal communication plays an important role in our economy. Laryngeal high-speed videos have emerged as a state of the art method to investigate vocal fold vibrations in the context of voice disorders affecting verbal communication. Segmentation of the glottis from these videos is required to analyze vocal fold vibrations. Integral image data structures are very useful in computer vision applications that involve machine learning approaches based on ensembles of weak learners. The weak learners often are simply several regional sums of intensities subtracted from each other. In this work we present a memory efficient integral volume data structure, that allows reduction of required RAM storage size in such a supervised learning framework using 3D training data. In this paper we consider the pairwise graph matching problem of finding correspondences between two point sets using unary and pairwise potentials, which analyze local descriptor similarity and geometric compatibility. This paper deals with segmentation of image sequences in an unsupervised manner with the goal of getting highly consistent segmentation results from frame-to-frame. We first introduce a segmentation method that uses results of the previous frame as initialization and significantly improves consistency in comparison to a single frame based approach. We also find correspondences between the segmented regions from one frame to the next to further increase consistency. 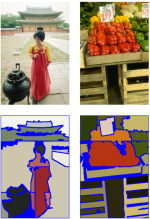 This paper introduces an unsupervised color segmentation method. The underlying idea is to segment the input image several times, each time focussing on a different salient part of the image and to subsequently merge all obtained results into one composite segmentation. We identify salient parts of the image by applying affinity propagation clustering to efficiently calculated local color and texture models. Each salient region then serves as an independent initialization for a figure/ground segmentation. Measuring the volume of heart ventricles is an important issue in heart disease diagnosis. Therefore many radiologists investigate computer tomographic images, searching for representative projections of the left ventricle. This paper describes the application of the LiveWire approach, an interactive segmentation technique which can be used as an alternative volume estimation method.